Banners.com: What are Pole Pockets? The standard finishing option for vinyl banners is hems and grommets, but we also have 2 inch pole pockets or 3 inch pole pockets available. Pole pockets are extra material wrapped around to the back side of the banner and heat welded to create a smooth 2 inch or 3 inch seam. They are similar to heat welded hems, but there is room for a pole or rode to go through the loop of material. You can have pole pockets on the top only, bottom only, right side only, left side only, both top and bottom, both right and left, or on all sides of the banner. The pole pockets are used to hang the banner. When you order a banner with pole pockets you will set up your artwork to the size you want it finished. 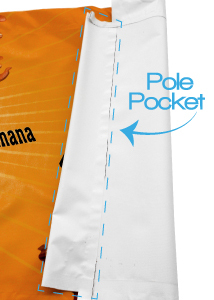 We will add the extra material for the pole pockets. You should keep all important text and images at least 3 inches away from the edge of the banner to avoid having a seam run through it. Click here for additional vinyl banner finishing options.